The Auckland tribe of Ngāti Whātua, together with 11 other iwi in the greater Auckland region, signed a treaty settlement transferring ownership of three local maunga (volcanic peaks) in February 2010. 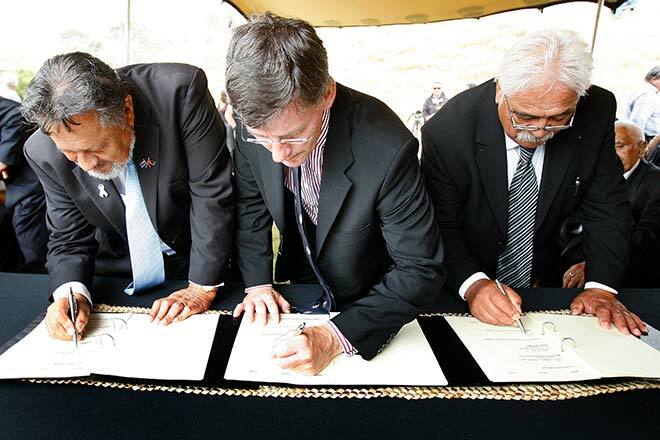 This photograph shows (left to right) Minister of Māori Affairs Pita Sharples, Minister for Treaty Negotiations Christopher Finlayson and Ngāti Whātua o Ōrākei Māori Trust Board chair Grant Hawke signing the settlement deed. Hawke said the agreement created an opportunity to put in place a comprehensive protection programme for the maunga.